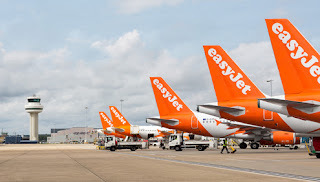 The low-cost European airline easyJet is doing well, just a few days ago it reported that revenue for the third quarter rose 14% to £1.6bn, with revenues from baggage and seat allocation up more than a fifth to £328m. The low-cost carrier operates over 300 aircraft to around 150 airports across 33 countries, easyJet remains committed to sustainable growth and these new routes are testement to that commitment. easyJet has also indicated that it plans to sue over French Air Traffic control strikes, which it says has cost the airline £25million and saw in more than 2,600 flights being cancelled in the three months to 30 June. Chief executive Johan Lundgren said the airline plans to file a legal challenge to the EU this week.